If you’re looking for a different kind of Valentine’s dessert to serve, check out these gorgeous Heart Meringues perfect for Valentine’s Day! Oh, friends! I super-de-duper love this recipe so much! I consistently shock the kids whenever I make meringues. They are totally MYSTIFIED how egg whites could cause such puffy cloud-like goodness just like these Heart Meringues. They watch with wonder and try to grasp it but can’t. We have so much fun making and decorating these! I hope you will too! The key to wonderfully light and decadent meringues is having your eggs left out to become room temperature before using them for this recipe – this is absolutely key! Room temperature eggs then become room temperature egg whites when you carefully separate the yolk from the egg, and this is a big deal for perfect meringue recipes! What lovely pink clouds, aren’t they? You could add a tiny speck of vanilla extract to this recipe if you wanted to, but for me, this recipe is perfect and light as it stands. So fluffy and creamy. Easy to decorate too! We used red sprinkles called “jimmies” but you could easily use whatever you’d like! Red heart shaped sprinkles or pearlized sprinkles would look absolutely amazing on these too! Once baked and cooled, these serve so easily and well! These are wonderful treats to serve at a Valentine’s Day party, or classroom party! You can even put them on a stick and wrap in cellophane to resemble a large lollipop! This cake pop kit from Amazon would work quite lovely for this purpose, provided you make the Heart Meringues small enough to fit inside the cellophane baggies! Bonus – by making them smaller, you’ll be making more meringues this way! Another thing to consider when making these is ensuring you have a good quality piping bag and Wilton tip to pipe these onto the parchment paper. You could use a reusable piping bag or a disposable one, the choice is ultimately yours! Piping the meringue onto the parchment paper once it’s made is the easiest and most decorative way to do these. We used the Wilton 1M decorating tip but you could easily use others depending on the look you wish to achieve! To start this recipe, line a baking sheet with parchment paper and preheat the oven to 200 degrees F. Set aside your lined baking sheet. In a medium-sized bowl, crack your eggs one by one, separating out the egg yolk from the egg white gently, and add your egg whites into the bowl. Using an electric mixer, beat your egg whites on medium speed. Add to the beaten egg whites your lemon juice. Continue mixing. Gradually increase the speed to high for the egg whites lemon juice mixture. Continue mixing as you slowly start adding sifted sugar into your bowl. You want to use sifted sugar to make it blend easier – no sugar chunks allowed! Once you achieve a smooth, white consistency with stiff peaks, add a few drops of red gel food coloring. Add as many drops as you like to reach your desired color. Continue to mix until color is well combined. Using your 1M Wilton tip and a good piping bag of your choosing attached and ready to go, add the meringue mixture into the piping bag. 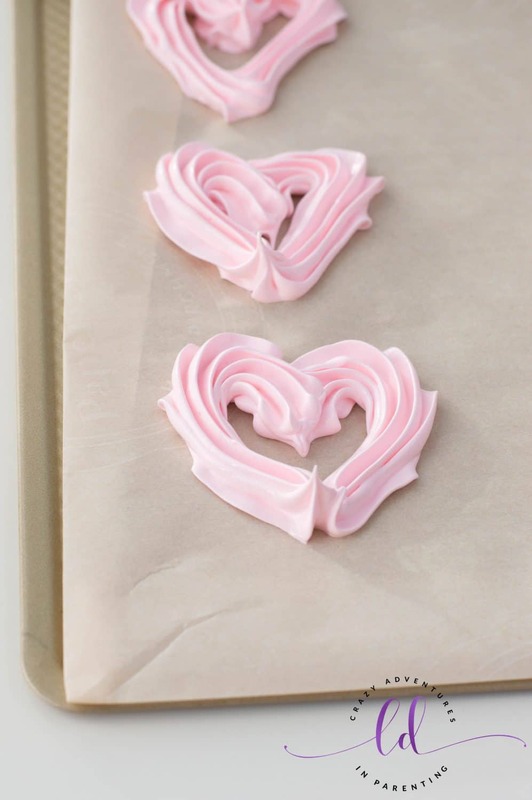 Pipe your meringue cookies into 2-inch or so heart outlines onto your lined baking pan, keeping them a couple of inches apart from each other. Continue piping out 12-15 heart shapes on your lined cookie sheet (depends on how big you make your hearts as to how many you will have as a result). Fill in all your heart outlines with the remaining meringue mix to close the heart into one solid shape. Decorate with red sprinkles (jimmies) or sprinkles of your choosing before baking. Bake your heart meringues for two hours. After two hours, turn off the heat and let sit in the oven for about a half hour to forty-five minutes. Remove from oven, peel off the parchment paper carefully, and allow to cool completely on a wire rack. Line a baking sheet with parchment paper and preheat the oven to 200 degrees F. Set your lined pan aside. In a medium-sized bowl, crack your eggs one by one and add your egg whites into it. Using an electric mixer, beat eggs on medium speed. Add lemon juice. Gradually increase the speed to high. Keep mixing while slowly adding sifted sugar. Once you achieve a smooth, white consistency with stiff peaks, add a few drops of red gel food coloring. Continue to mix until color is well combined. Attach your 1M Wilton tip to a piping bag and add your meringue. Pipe 2-inch meringue cookies heart outlines onto your lined baking pan, keeping them a couple of inches apart from each other. Fill in all your heart outlines with the remaining meringue mix. Garnish with red sprinkles before baking. Bake your heart meringues for two hours. After two hours, turn off the heat and let sit in the oven for about a 1/2 hour to 45 minutes. Remove from oven, peel off the parchment paper carefully, and allow to cool on a wire rack.